Take a look at some of these baby Halloween costumes that will make your baby’s first Halloween an absolute treat! There are a lot of “firsts” in your little one’s first year of life. From holidays to haircuts, it seems like every time you look up there’s a brand-new experience waiting for you. With the new season right around the corner, pumpkin decorations are popping up everywhere and it’s time to start putting together first Halloween costumes! Asher will be a little young to really experience it this year, but we absolutely cannot wait to dress him up and eat all of his candy! Take a look at some of these adorable choices that will make baby’s first Halloween an absolute treat! With The Incredibles II set to release right around Halloween (DVDs are already on pre-order for their November 6th release and Digital HD releases October 23rd) you can bet this will be a costume everyone will get excited about. And the best part is, the entire family can get in on this one! Dads, moms, and big brothers or sisters can dress up to fight crime and eat candy while the baby just sits back and looks adorable in his little Jack-Jack costume. For babies who prefer to be worn (or mamas whose arms might get tired! ), there are tons of super cute options that will still get the littlest member of your family involved in the fun. There are plenty of costumes specially made to fit over a baby carrier, from the more traditional pumpkin outfit to full-on get-ups that come with an outfit for Mom, too! Dress as a scuba diver with an adorable little octopus in tow or top your head with a Chef’s hat while baby wears a lobster outfit that’s as sweet as it is funny. Yes, twin mamas, I see you too! Whether you usually dress them to match or prefer to let them each have their own looks, I think we can all agree that there is almost nothing more precious than twin Halloween costumes. Call me old-fashioned, but I absolutely can’t resist Thing One and Thing Two. If you’re not a Dr. Seuss fan, you still have a lot to choose from. For a mom who is already dealing with two sets of feedings, changes, and naps though, why not go for something simple? There are so many cute themed onesies available, like these tuxedo and fancy dress pairs, that will make those emergency diaper changes—the ones you know are going to happen in the middle of trick-or-treating—a breeze! Do you live in an area that’s sure to be shivering cold by October 31st? Your baby can still be dressed to impress while snuggled up and cozy! Check into costume rompers and full-body onesies that will keep those little arms and legs cute and covered. He can be a fox, a bear, or even a shark (isn’t that hood with the teeth the sweetest?) You could also go for this little sheep bunting wrap that would still work later for an extra-cute everyday cover-up. What if you’re hoping to announce a bun in the oven on All Hallows Eve? See how long it takes people to catch on with one of these maternity skeleton shirts, complete with a little baby skeleton! For a spooky gender reveal, there are also baby boy and baby girl versions. You’ll have a very happy Halloween once everyone knows you’re eating candy for two! What about you? 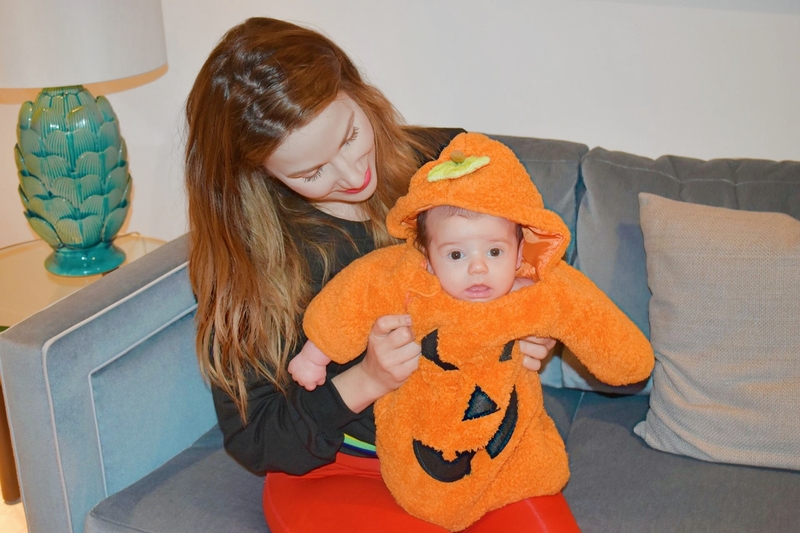 Do you already know what your baby’s first Halloween will look like? If not, hopefully one of these costumes will help you put together a “first” to remember. Take a look at my Instagram after Halloween to see what we chose for baby Asher! You might also enjoy these 15 Creepy DIY Halloween Costume Ideas.